It has been a really good year. I did my first “training camp” over Memorial Day weekend and finally was able, after years of intentions, to ride a big section of Skyline Drive. 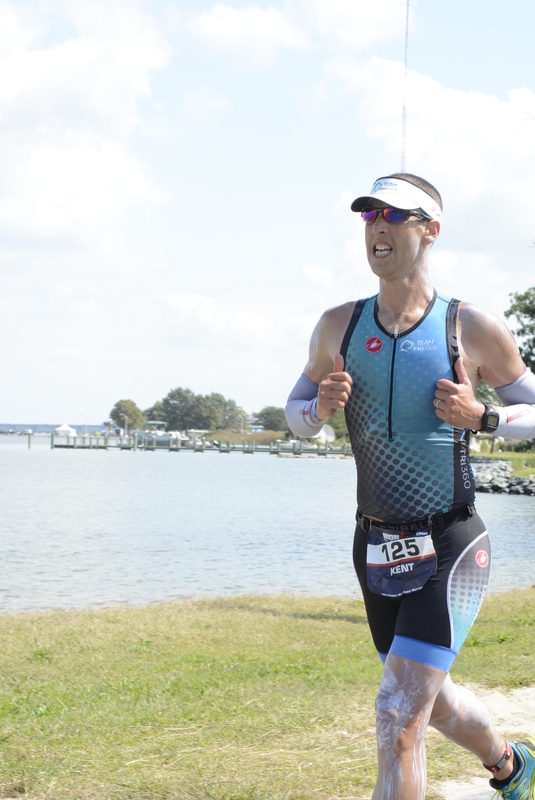 Puerto Rico was big fun, Raleigh rewarded me with a best time and moreso with a father-daughter weekend trip, at Monticelloman and Colonial Beach I ran personal bests for the 10k, and I soaked in joy of the Chesapeake on a 90+ degree day for the GCBS. IMCDA and the Ocean Games both extended my horizons by creating opportunities to keep looking for my limits. At the former, I showed up more fit than I’ve ever been for a triathlon. At the latter, I literally jumped in with both feet to try something new. We’ve been married 15 years. They have been hard, wonderful, enriching and life-filled years. We’ve loved, lost, doubted, grieved, moved and grown. We have made big life decisions and been wrong. We have made life-altering changes that have been rewarding beyond expectation. What a ride. We rented an efficiency apartment and then a tiny one-bedroom house. We’re now on to owning our third house — and at 8+ years have lived in it for longer than all the other places together. We have four wonderful children who everyday remind me how crazy, exotic and surprising they can each be in their individualism, generosity and sheer wackiness. We have jobs, hobbies and passions, enviable health and enough resources to keep paying the bills every month. Monday morning in the Ocean Park neighborhood of San Juan. We have also been through a failed adoption, five miscarriages, sudden job loss, a catastrophic accident for a close family member, death of loved ones and the ongoing challenges of aging parents. We’ve had a life, and we’re just getting started. One day last weekend, there was a meltdown over the rules of a board game, a band competition, the first soccer game of the season, track practice, drop-off for a sleepover, going out to the local burger joint and frozen custard shop and more games and reading before bed. That is just the kids. In between, Dana did her thing and I mine — which consisted of 95 minutes on the trainer, a four mile run and some strength exercises. I fell asleep on the couch with one of the Narnia books at my fingertips — reading time abbreviated by Papa’s inability to stay awake. I wonder how we ever left for a weekend. But we did. 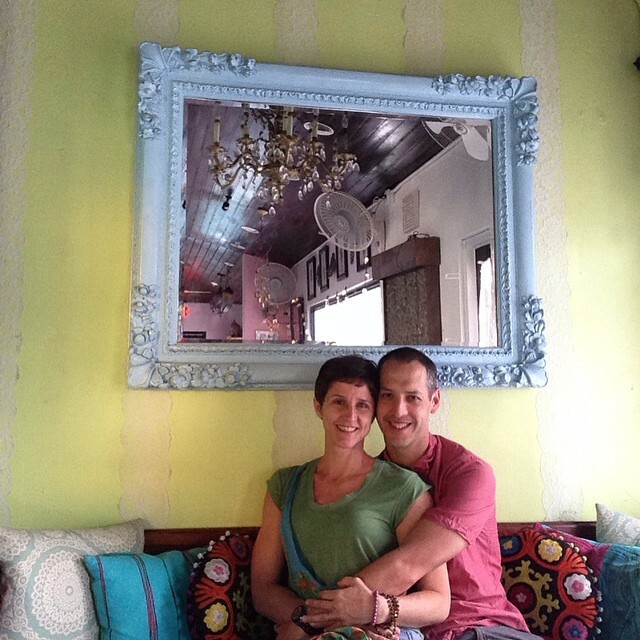 Dana and I went to San Juan to celebrate our anniversary. She was able to spend time — twice a day most days — with her favorite teachers taking part in a special workshop in an airy studio blocks from the beach. I raced. 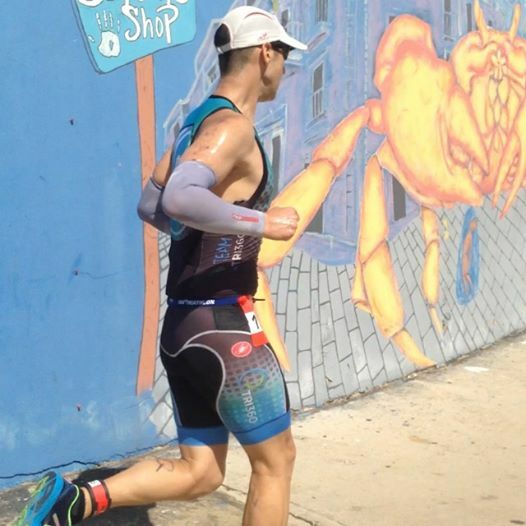 The Ironman Puerto Rico 70.3 is on a fantastic course. We swam in a protected lagoon (with manatees!) while the bike course quickly exits San Juan via closed highways and puts the Atlantic over your shoulder for a good portion of the ride before you turn south and find mountains on the horizon. The run course is also spectacular. It is hot, largely unshaded, full of hills and it takes you through Old San Juan and past two towering forts. We stayed in a hotel with a balcony overlooking the lagoon where the swim took place. Not long before the race starts and before everyone swims under the bridge that I’m standing on. I love her and cannot wait to see what comes next for us. My favorite picture from the race. A friend always says about challenges, “Make sure you are running to something and not just away from something. I’m running headlong into the next 15, no 50, years together. When I can, moreso in the summer than the winter, I frequent a handful of triathlon focused sites. I read Slowtwitch and Triathlete Magazine articles. I really enjoy the Down Under perspective from First Off the Bike. The business of triathlon is covered at the predictably named Triathlon Business. I follow several professionals’ social media accounts. It was through social media that last year I found WITSUP. At first glance, you might think a site devoted to women in triathlon would not be so interesting to me. But, you’d be wrong. They do nice interviews, the content — nearly all as far as I can tell — written by women is not always just for women but for triathletes. Recently, the WITSUP community (like FOTB, also based in Australia) has gone to the front of the parade for changes in how professional races are staged — especially the Ironman World Championships and the biggest of the Challenge races. A four-part series on gender equity in triathlon is currently being published. Sara Gross is thorough and even-handed. Part two of the series is here. As best I can tell they are also leading the effort to work constructively with the new Women In Tri panel established by WTC. Go here to get a concise overview of the issues at stake and to lend your own support to the cause. Being a fan — watching the development of races, seeing the human struggle and triumph, marveling at the execution of near super-human feats — brought the issue to my attention. As I have developed as an athlete I’ve also gained a sliver of insight into how some of the structural problems affect the professional field — especially draft packs and the effect of strong swim-bikers and how they can affect the female professionals. As a fan, I want to see deep and competitive fields and not tactics compromised by another simultaneous race happening on the same course. Last night I took my 10 year old daughter to run with me at the track. Afterward, we talked about what she saw. It was an interval session with nearly 30 members of the club present. I ran near the front of the second group and to her, I was going “super fast”. She was polite enough not to point out how I struggled with the last 800. I highlighted that the bulk of the leading group were women. We talked about them by name and accomplishment: Mothers, 20-something professionals, a 50+ national caliber and record setting age-grouper, former NCAA Division I runners, a doctor, a writer. Our family has resources. My children have a strong and accomplished mother demonstrating how to live well. In the end, they will be okay. But they and so many others will have their horizons broadened — in sport, in business, the arts, academia, the non-profit community — when they have heroes with whom they relate. Lend your support today. Make room for the next generation of heroes on the Kona pier. “I’ve never raced as a 41 year old before,” he says. He’s still learning — about the race, about the competition, about his own body and response to work. Humans have a powerful ability to rationalize behavior. Some rationalizations create their own positive feedback loops. In this case, positive does not necessarily mean good. It refers to self-reinforcing situations — new data points are created from the initial mistake which reinforce the rationalization made for that mistaken behavior. All of this is well and good and may even help you understand self-defeating behaviors or why it is hard for people to accept responsibility for bad decisions. More important for our discussion here, rationalization of mistakes is doubly, triply, super-duper more powerful in the middle of an endurance race. My run at Ironman was not horrible. In fact, it was only 4 minutes and 12 seconds slower than my best. I didn’t have a total break that caused me to lose scores of minutes walking. Nor did I run myself into the arms of the medical personnel who hovered all afternoon like morbid angels of the dreaded DNF. I got off to a good start. After a too aggressive first mile in 7:32, I went 8:05, 8:01, 8:15, 8:17. I ran well, relatively steady and in the basic zone of my race plan for five miles. Then I stopped to pee. The all-knowing Garmin doesn’t lie. I was roadside for about 60-75 seconds at an aid station. My heart rate dropped and something got in my head. It was at this point that I thought I couldn’t run the plan, I thought it was too aggressive. For whatever reason, I had the idea firmly locked in mind that my run targets for heart rate and pace were too much just like on the bike. Suddenly, I was back running but my heart rate had dropped from a consistent 144-145 to 140-141. Within two miles I was running 30 seconds slower per mile and my heart rate dropped to where it would stay for the rest of the race in the 136-139 range. Unwittingly — that is without conscious effort — I was creating the data points to reinforce my decision to lay off on the run. It is a hard lesson to learn — to know when to go for it, when to keep pressing and when to back off to avoid catastrophic results. Guess who went for his annual skin cancer check up less than three weeks before the race. Sure, I know that a forward lean helps but I cannot help but think this shot makes me look like I need to drop serious weight at the next port-a-john. These photos always make me chuckle because it looks like my feet barely clear the pavement. Going slower didn’t make it any easier. It was hot, largely unshaded and I’d already been out for more than six hours. I had twenty-odd miles to go. Going slower just made it take longer. Reflecting on the charts and data, I can see that I definitely had at least seven to eight miles on track with my original plan and probably more like 15 available. The first mistake was thinking that a stop to pee would only cost 45 seconds. It robbed me of momentum, consistency of mind and confidence that I was on track as long as I focused on the mile in front of me. In that cramped, plastic, hothouse of human waste I had time to think of how much course I had left, of the hours in front of me. When that happens, it becomes game-over because the rationalizations are just around the corner. The second mistake was what proved fatal to my goal of running a best time and staying competitive in my age-group on the run. I turned to my Plan B too early. A few hundred meters down the road from the toilet I was recalculating the afternoon. I was rationalizing that I would walk every aid station from this point forward. I gave credence to a low heart rate as okay because it meant I wouldn’t blow up. These valid but unhelpful mental gymnastics also meant that I would add 15-30 seconds to every mile and that while I wouldn’t blow up, I would fail to ever press the pace. I should say at least one positive thing about my run. My kit didn’t chafe in any of the sensitive areas. There was a bit of scraping at the top of the zipper in front, but otherwise A-1 by Castelli. It was not a stroll in the park, but by reverting to Plan B too early I gave up. It was a mental mistake that had immediate and lasting physiological effects. I didn’t run fearless. I didn’t run worried about my calf. I didn’t think about how I was heavier than last year. 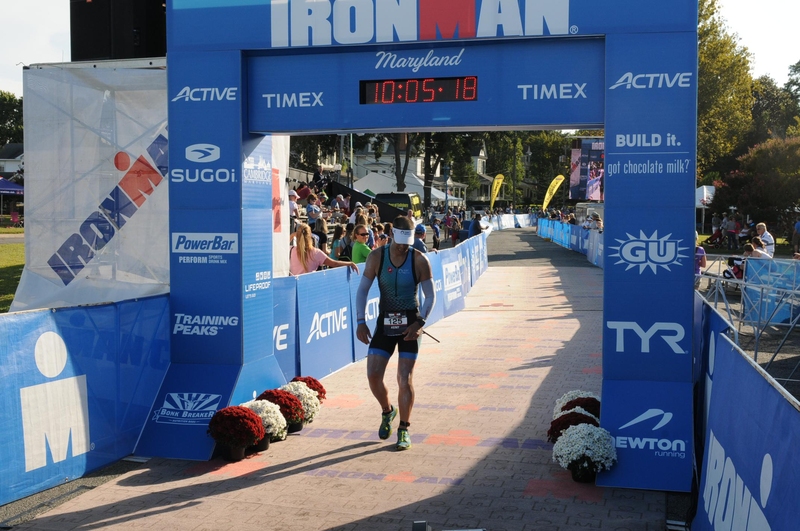 (Kent’s Ironman race weight history: 2012 — 183, 2013 — 175, 2014 — 184.) I wasn’t thinking about running in the red zone of mid to high 150s heart rate. I wasn’t worrying — but all of that was somewhere in the stew of subconscious and provided the compost necessary to fertilize passing thoughts into full grown rationalizations. To run an Ironman successfully, I imagine the mind must be sterilized of these shadowy reservations. Clinical, like an operating room, an athlete must be ready to demand the absurd from himself and to do it unselfconsciously. I must learn to run without fear. A few words on the course itself. It is flat. It is more flat than anywhere I’ve run excepting a track. It is however somewhat “technical” in that there are many 90 degree turns and two 180 turnaround which each must be navigated multiple times. The organizers took the course up and down High Street in Cambridge which is brick instead of asphalt. High Street provided the only “hill” worth mentioning and it wasn’t hard so much as it surprised my dulled senses each time I came to it. The hill is probably 800-1200 meters long with an aid station about 85 percent of the way to the top. Upon reaching the top of the hill, the course turns left down a street lined with shops and restaurants for a few hundred meters. This was the loudest, most boisterous and lively section of the course. There was room on the sidewalks for spectators to line up near the course fences. There was at least one if not more restaurants open with patio seating and it was near where the shuttle buses were running and made access easy for the fan base. On the third lap, at the very end of this street is where athletes turn left for the final mile to the finish line instead of turning right and heading down the length of the entire course again. Realerrevival Brewing hosted many fans, many of whom hoisted many a brew on race day. I’ve always known that I have short legs — but this is just silly. Seriously, is my torso five feet long? Several times during the race I found myself carrying empty cups until the next aid station. Every time it surprised the volunteers when I dropped cups before grabbing something new. This shot of me running up High Street shows that the bricks presented their share of uneven terrain. It wasn’t a problem but I imagine may become so once darkness falls. Somewhere around the 9:50 mark I figured out that I wouldn’t break 10 hours. I had not been aiming for it, nor had I been thinking about it during the race. But when the realization hit me, it was a bit of a letdown. The minute it takes to go 9:59 versus 10:00:00 is no longer nor is it harder earned than the one that moves you from 10:04 to 10:03. Still, there is a huge psychological effect and if this post is about anything, it is about the power of the mind to control the body. I had a very good day. I had a solid, respectable run. If I were to rationalize today, I’d say that the run was strong considering the training leading up to it. Enough with the rationalizations though, I know that I’ve run about a third less than last year and didn’t start running until Memorial Day. I was physically strong enough to handle the distance and that is the only fact of import. Arguably my legs didn’t have enough miles in them to show the resilience necessary to fight through the really hard miles of 15-20. But we won’t know, because I didn’t go there. Most importantly, my mind didn’t have the miles in it to be unbreakable, strong and focused in the face of distraction, discomfort and false signals telling it that I ought to slow down. That is the mistake, the failing, of the day. Finish line photos often capture joy, triumph, elation. On the spectrum of emotion, each has its counterpart in full measure. There is disbelief that the whole escapade is ending. Triumph in the heart is but a thin patina for the hurt way down deep in your bones, joints and muscles. My experience, n=3, is of a profound exhaustion that nearly transforms elation into a jellylike collapse the moment I cross the line. Yin and yang — paired, balanced and available only after having overcome the obstacles presented by the day. This is my favorite photo of the day. It includes subtle virtues — it is rare for anyone to get a shot of the finish arch with the time matching their actual time but I started within seconds of the gun and there was no pro field. It has a solitary protagonist and as much as it is true — so very, very true — that no one does one of these races alone but always through the sacrifice of family, friends, co-workers, volunteers, organizers, first responders, law enforcement, deep down I think we all like to be a little bit of our own hero. Ironman lets you play hero for the day. It has interesting light, colors and shapes. Most of all, after a day of keeping my head up when my swim split was far slower than I expected, when I could not reliably come close to my targets on the bike, when I had taken the easy path and rationalized my way through Plan B on the run, I still got through it. I made it. The race was not won, but it was done. I finished and though weary, I was worthy. As in life, we all finish alone. If we are blessed, the shadows will be long, the regrets few and the joy of our experiences will lift up the heaviest of feet for the final step across the threshold to the next adventure. Also, there won’t be ponderous comparisons of a life well-lived to an athletic competition. This weekend I’ll try to get a short synopsis of the recent bike ride up here. In the meantime, a short anecdote and a set of photos follow. I didn’t quite softpedal, but I also didn’t push it above 170 watts for the first 10 minutes. It allowed me to fix my sleeves, take a drink and get settled for the morning. The light was still soft at about 8.00 a.m. The sleeves ended up being good for sun protection but I didn’t use them as coolers. If you dump water over them they act like mini air conditioners while they dry from the wind. The first few miles were through neighborhoods on wide roads with several 90 degree turns. After a while, all bike pictures start to look the same. The scenery however kept changing even though the majority of the ride was in the same preserve. The conditions were great for riding. The sun came up and it got warm but never oppressive. Is my saddle high enough? Perhaps I need a new fit. When turning, look where you want to go. After years and thousands of miles on this bike, I am undeniably comfortable on it. The road had several turns — more than I expected from the course map. My arms look like sausages. Good thing I don’t have body image issues. Despite the roads remaining open, there was only one section of less than 10 miles where there was any car traffic of note.